The heat continues unabated and we have settled into a routine of sorts. Up early to walk the dog and perhaps do a little work on the finca. You might wonder why Steve is wearing gloves and long sleeves and trousers when the temperature, even so early, is very hot. Last year when he did not he ended up with huge blisters on his skin. It is caused by something the fig tree secretes that is an irritant and is exacerbated by exposure to uv rays and can produce such horrific blisters that end up scarring for life. So... who thought it was a good idea for Adam and Eve to use fig leaves to hide their embarrassment? Which Steve made all by himself. First time jam maker and it is most definitely a success. Won't know for about a year whether we can drink that one! Hey ho... we aren't going anywhere. And I have been able to do a little knitting in the mornings before it gets too hot to hold the needles without sweating. 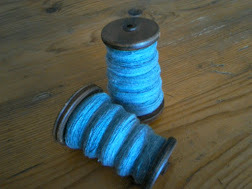 I have been using a very fine home spun Merino 2ply and I am making a new born baby jumper. In fact it is turning out so small that perhaps it will end up on a doll. Or perhaps it will fit for a day or two before baby grows out of it. Which baby though? Well .... we are expecting our second grandchild which will arrive next January and we are as thrilled as can be. So the days pass, one very much like the next. We have been making plans, reorganising the garden in our heads, talking to the builder about garden walls and pathways and possibly an outdoor kitchen in the autumn. The cotton I planted has flowered and there are large bolls on the plants but when they will burst into fluffy cotton buds I don't know. I wait and watch and water regularly and hope that I might at least get a little thread spun... perhaps enough to embroider baby's initials onto something. That would be nice. Relentless eat here too, though we had a splash of rain in the night. It was so hot it dried as it touched the ground! Fig and ginger jam is a huge hit with the Bulgarians, they buy it in multiples and I can't keep up with demand. Maybe not tis year though, our fig died back to the ground last winter and it's taking it's time to regenerate. Sounds yummy with ginger. Next batch then lol! We have 38 fig trees at last count, although some are quite young, and they all produce something so we never have issues of running out. Alot of work at the hottest time of year too! Very impressed with your wool Jane. You are a fast learner! We had a fig tree in our last garden but I never mastered the art of drying them - it was probably not hot enough.At the time didn't get round to making jam either. Miss them though as they tasted yummy fresh from the tree.